Eisermann, K. & S. N. G. Howell (2011). 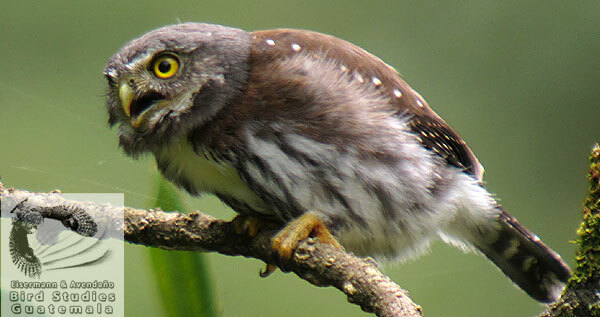 Vocalizations of the Guatemalan Pygmy-Owl (Glaucidium cobanense). Journal of Raptor Research 45: 304-314. Abstract: The lowlands of the Isthmus of Tehuantepec separate the range of the Guatemalan Pygmy-Owl (Glaucidium cobanense), recognized as a species in modern owl taxonomy and resident in the highlands of southeastern Mexico, Guatemala, and Honduras, from the range of Mountain Pygmy-Owl (Glaucidium gnoma) in the Mexican highlands northwest of the isthmus. Here we document hitherto undescribed vocalizations of Guatemalan Pygmy-Owls in the Guatemala-Chiapas highlands. We recorded four different vocalization types of adults: (1) territorial toot calls, (2) whiwhiwhi calls given by the female during nest-site establishment, (3) soft toot calls of the male near the nest, and (4) copulation calls. The territorial toot calls of Guatemalan Pygmy-Owls differed from those of Mountain Pygmy-Owls in Mexico. The mean individual call rate of Guatemalan Pygmy-Owls was 3.4 ± 0.5 notes/sec (n = 49 call series of six individuals), significantly higher than in Mountain Pygmy-Owls (1.9 ± 0.3 notes/sec, n = 34 call series of eight individuals). This new evidence of vocal differences supports modern taxonomic separation of both taxa. Howell, S. N. G. & K. Eisermann (2011) Guatemalan Pygmy-Owl Glaucidium cobanense is a good species. Neotropical Birding 9: 74-76. A male of the brown morph calling from a branch of Guatemalan Fir (Abies guatemalensis), mobbed by a White-eared Hummingbird. Video by Knut Eisermann. A male of the brown morph calling, mobbed by a Rufous Sabrewing. Video by Knut Eisermann. 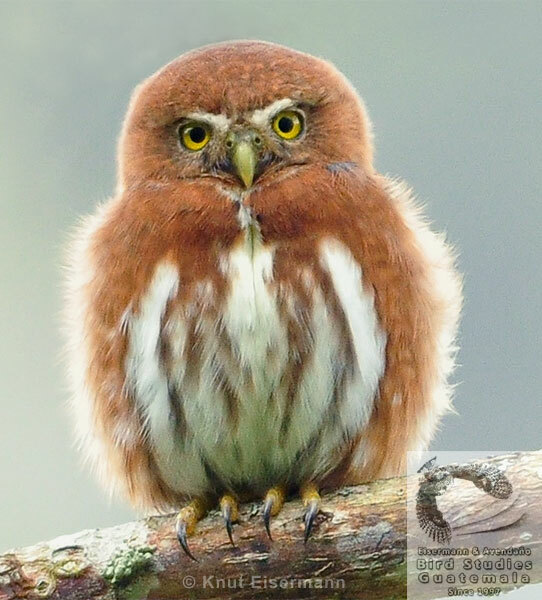 Guatemalan Pygmy-Owl (Glaucidium cobanense) occurs in the highlands of northern Central America, including Chiapas (Mexico), Guatemala, and Honduras.